I haven’t left the continent in quite a while now and I have the fidgets. One of the great side effects of not having a regular sort-of-full-time job is that I can say yes to some opportunities that I’d been missing out on. Backstory: I am on the Advisory Board to the Wikimedia Foundation. Just one of the service-type things that I do. Mostly we just answer questions if asked, it’s not a high commitment thing, but I enjoy being involved because I believe in the Wikimedia/Wikipedia vision, imperfect as it may be. So one of the things available to the Advisory Board members is travel to the annual Wikimania Conference. This year it is in London. I have always wanted to go to London. It’s a little weird to me that for all my international travel I’ve never been to any of Western Europe. So I’m leaving tomorrow and today is getting all my ducks in a row, including writing some stuff in this slightly slow-motion blog. An odd side effect of not having an internet job (mostly, the Open Library gig is super part time) is that emails languish in my inbox and my blogs are a little unattended. So I’ve been spending a lot of time since mid-June down in Westport (with a trip back up for July 4th and now again) and doing a variety of things. A partial list. Links usually go to photos or talks. Gave a fun as heck talk at the Somerville Public Library in June: Why the public library is different from anything else (and maybe better). Super fun, big thanks to James Fox for getting it all together. 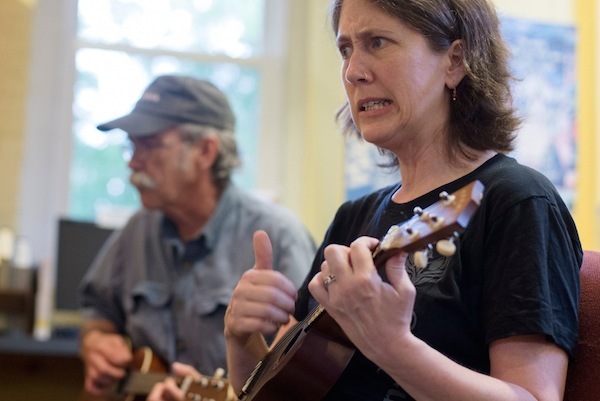 Went to my second ukulele group meeting in Randolph and got my picture in the paper! If you are saying “Jessamyn, I did not know you played ukulele!” you are mostly right. That’s why I go to the group! Randolph’s always-excellent 4th of July parade. I swear next year I will go in a bee costume. Weekend hanging out in Westport with my sister, our friend Brian, my friend Robert, my friend Michelle and, as always, Jim. MetaFilter’s 15th Anniversary celebration: Board Game Party! Gave a really fun talk in Ashfield MA talking about why we’re not yet at the promised future. A lot of fun, a lively crowd and some hangout time with old family friends. There is really nothing like being introduced by someone who has known you since you were in utero. So, now that you are caught up, I am leaving to go to London for Wikimania where I will be volunteering in the Press Office and trying to go see a bunch of talks and get my phone working correctly. Don’t call me. I won’t answer. I have some library tours and maybe a Meetup scheduled. I’m trying to play the rest of it by ear other than making sure I have enough reading material to last me through a six hour plane ride there and back (seriously, this and sleeping are my largest travel concerns) and the right clothes to wear. Despite this list, I feel like I’ve been able to have a lot of lazy downtime, more than usual. This may be because I’m just calmer inside than I’ve been for the past few years, or it may be that for the first time in a really long time, I’m doing summer right (for me).